I am often told, “It is cheaper to buy fruits and vegetables than to raise them.” I have nothing to say in reply. There are many cheap things we can have. Experience has proved that one of the best things we can have is a garden, either to work in or to visit daily when the season permits. We have but one life to live here, and to get the cheapest things out of it is rather poor ambition. I couldn't agree more. We need to take the best from the past and team it up with the best new ideas to create a better future. Herrick strikes me as the sort of fellow who understands this wholeheartedly. 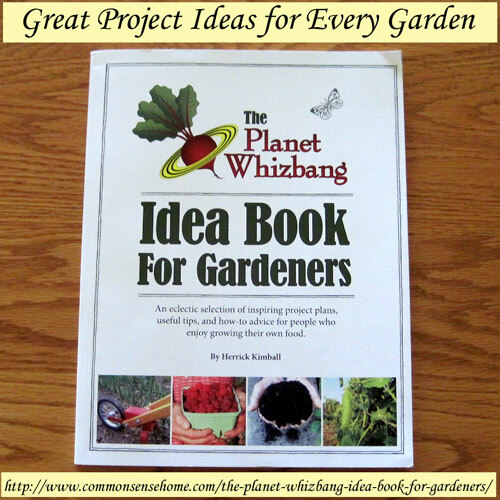 One “project” that I implemented right away (that had me thinking “I should have thought of that” was How to Make a Whizbang Pocket Cultivator. Herrick re-purposed an old fork by giving it a nice tape-padded handle for an easier grip. This hand cultivator is then used to work up the soil in tight areas between closely spaced or small plants. The last time I swung through Goodwill, I hit the mis-matched silverware bin and found myself a nice bent tine fork with a chunky handle. Ta-da! Hand cultivator. Just for the record, I received nothing for doing this review other than a copy of this book and another book of Herrick's, Writings of a Deliberate Agrarian. I believe that this is an exceptional book that my readers will enjoy, so I chose to share it with you. Note: This post did include a giveaway when it first went live, but the giveaway has ended. Melody – did you enter your information in the widget? That tracks everyone’s entry and does the drawing for me so it is completely impartial. As a relatively new gardener, there is much much more for me to learn! This book looks fascinating and I would LOVE to win a copy of it. I need to learn a TON. Love the title. I would like to learn more about getting the most, and healthiest food from what I grow, in the space I have. I am so new at this, and learning as I go. I’d like to learn more about how to prune raspberries, guide vine growth so it doesn’t get all too hard to get at the berries. This book looks really fun and interesting! I would Love to win it! Sounds like a great book! We are buying our first house and I’d like to use this book for garden ideas. Looks like a great book for idea inspiration. My biggest challenge now that I have space to garden is figuring out how to inexpensively build up my gardens. I know there are farms around and I’d LOVE to get a whole lot of manure for them, but I have no truck or other way of hauling and I’m just not sure what other materials I could use. We’ve got very clay heavy soil and I’m planning on getting all the chopped up leaves I can, probably buying compost to be delivered and what else I’m not sure…I’d love ideas! Ideally I’d like to do a layered garden and not till if possible…. I would love to learn more about combining plants together when they are planted to help them get the nutrients they need from the soil and also help be natural bug repellent. I don’t know what the best combinations are, so it would be fun to get information about it. How to get my containers to do better.. Sigh.. I love gardening and would love new ideas! Any easy gardening suggestions for single old ladies with arthritis (god, that sounds sad)? I never tire of learning anything. All that improves my abilities as a gardener, in in any other area is appreciated. I definitely need this as a resource! I have enjoyed the comments on this website. Also have tried some of the suggestions that I have found in my own garden. Keep up the good work. I would like to know more about seed saving and starting plants from cuttings. I’m new at following Common Sense, but I’m enjoying what I’ve seen so far. Looking forward to what comes next. Maybe homemade ice cream? I do have an ice cream attachment for my KitchenAid, and have been known to put it to use now and again. I love your blog. As a beginning gardener I would like to get my soil as healthy as I can so that the food I grow will be nutritious. You asked what I would like to know more about. That is a really tough question to answer. I guess the thing that most confuses me is the pattern and compatibility of a garden. Should I make my raised beds (Furrows) go north and south or should I make them go east and west. I live in Western Washington at the bottom of the Rain Forest. I know that Corn goes on one side and receives sun all day long. I could really use a map to plant by with North marked for me. LOL. I’d like to learn more about raised bed gardening–especially for tomatoes. I could use the book a lot ! I want to know more about how to keep weeds and grass out of my garden and how to get more blueberries on my blueberry plants and how to get the plants to grow really big, also I want to learn how to get a better yield from cucumbers, tomatoes green bell peppers and everything else in my garden ! I am really excited about winning this book ! The whole book looks great but I am really interested in making forever plant tags! Would love to use this book as I get back into my gardening! This book seems very impressive. I’m a beginner gardener and love what I’ve done so far. Thanks for offering this. I’m a beginner gardener and I would love to have this book. I am new to gardening and the book looks great! I need to learn so much, so it would be great to win this! Thanks for the opportunity. 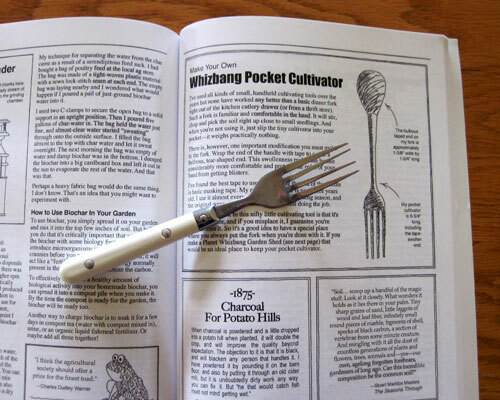 this looks like a nifty book – love the fork tip! I am trying square foot gardening for first time and so far the bugs are eating my crops as fast as I can plant them. I have tried several eco-friendly sprays such as garlic, hot pepper spray, dawn mixture, etc. Out of five tomato plants I may have gotten a dozen tomatoes and had my first run in with cutworms (which I made my husband pluck off ha ha). There are two things I’d actually like to learn more about. One is aquaculture but the one I’d really like to more about is permaculture. Great giveaway thanks for the opportunity to win this book. Good luck everyone. I like learning about anything that makes gardening easier! I always need any help with gardening I can get!! Now HERE is a book I will buy, if I am not lucky enough to win it! Let’s see, a comment about what I want to learn about gardening. . .other than, ‘all of it’? How about. . .I want to learn more about companion gardening. This book sounds very interesting. Could always use new tips and ideas. Started growing some herbs this year and planted one tomato plant in a large patio pot. It’s great to see a review of the book. I was a little on the fence about purchasing, but if I don’t win this copy, I’m definitely going to purchase a copy of my own. Would sooooo love this book….would also like to know more about making and using biochar. Sounds like a very cool helpful book. My biggest problem with gardening is finding the time and convincing my husband we don’t need to till but do lasagna gardening. Raising berries, asparagus, perennial type stuff. Maintaining fruit trees organically. Love Herrick’s other books. Looking forward to reading this one. I would love to have this book. One thing I am really interested in learning about gardening right now is organic soil preparation. I’m very new to gardening. I have SO many questions I’m not even sure where to begin! I guess I’d like to know which plants are good companions for others and how to rotate crops for best nutrition. This book would be awesome to get! I am a beginner gardener and we plant a small garden of basic vegetables. We buy starter plants and plant them but they start to die and by July when we should have nice veggies we have nothing. Its happened for the last 2 years. We watered it everyday and I have no idea why it won’t grow. So any information on items like this would be helpful. So much to learn! We just bought a house and I’d like to learn how to take care of the blackberries and raspberries the previous owner left for us. I am building a key hole garden right now, so that is my focus. I’d love to learn even more about composting! this would be a great book to add to my collection! We plan to start a garden next year and I would love tips for preparing garden beds for maximum soil health. This books looks fun and full of good ideas! The reason that bloggers have additional entry options is that it makes a dramatic different in traffic to the site. We’re competing head to head with huge websites with big budgets like Mother Earth News. I don’t have an advertising team or advertising budget. All I have is thoughtful readers who are willing to share my posts – or the promoting that I do myself. I always have an basic easy entry option – other entries are completely optional. Love the Deliberate Agrarian and Planet Whizbang! Please enter me! Our family really enjoys Herrick Kimball’s blog, too: http://www.thedeliberateagrarian.blogspot.com . We’ve also built and utilized one of his Whizbang chicken pluckers. Well worth checking out! I’m an old gardener but I love to read books like this because IO always learn something new! I am getting so frustrated with gardening lately – maybe I need this book to energize me again! LOL It is getting so hard to get a decent harvest from our Michigan garden I’m almost ready to move but wondering if everyone everywhere feels that way or if it’s just me 🙂 Regardless- I’d love to read this book since I’ve read Herrick’s blog for years. Ooh! I want that book! Planted our 1st garden this spring and looking forward to growing it each year. Ah, gardening is one of my favorite activities. Will have to check out this book. All of my child’s doctors have stated that I need to get him off of processed foods, and go back to more natural food for him. I need to learn everything, literally everything! This would be an awesome book to have! I’m new to gardening this year and could use all the knowledge I can get. It really appeals to me that the book incorporates old and new ideas! Thanks for your blog! This book sounds fabulous! I too would like to learn more about raised bed gardening. But then again, learning anything new about gardening or many other topics is always an enjoyable thing for me. Looks like a really cool book to add to the library! I would love to know more about my Yucca plants. This book looks amazing! This would definitely be a keeper!! Thanks so much! I really need to learn more about which insects are beneficial and which are not! I had not heard about this book! It’s a must-buy if I don’t luck out and win! I would love this book. I have been growing for the last two years and i have add more each year. So i want to keep on going. Looks like a great book, and I really could use it. You are so creative! I would love to see what you have up your sleeve in this book. I love gardening and would love to have better ways to do it. Laurie I so want this book myself to add to the rest of my reference books on how to be a better gardener. I’m now reading and researching permaculture and how to better utilize my landscaping. Fascinating topic and I’ve already started enriching my soil by growing winter rye (cover crop) in my gardens to help replenish my nitrogen back into the soil. With planting winter rye I’m also going to do my planting right into the cover crop to help with erosion and save moisture. Thanks for the post on this book and where do I enter my name to win? The giveaway was a part of the review when it was first posted. Sorry for any confusion. You may be able to find a copy at your local library, too.